Meghan wants to join the Peace Corps, return to Mongolia someday, and she is looking for research that scratches the right itch. Meghan Kajihara is an anthropology major and UNT graduate who spent a large part of her college career at xREZ Art + Science Lab working on the Segmentation team, discovering how experts deal with 3D data. She also traveled to Mongolia in 2014 to learn alongside eco-tourism students and then teach English for three weeks in Baruun Urt. For Meghan working on xREZ projects was an eye-opener to the messy side of science and the most interesting sides of humans, whether high-tech expert or everyday Luddite. Anthropology, says Kajihara, can be applied to anything that deals with the nature of people. News@xREZ talked with Meghan and learned about her plans to pursue various research internships, fellowships, and possibly teach English in the Peace Corps after graduation. Read the full interview below. 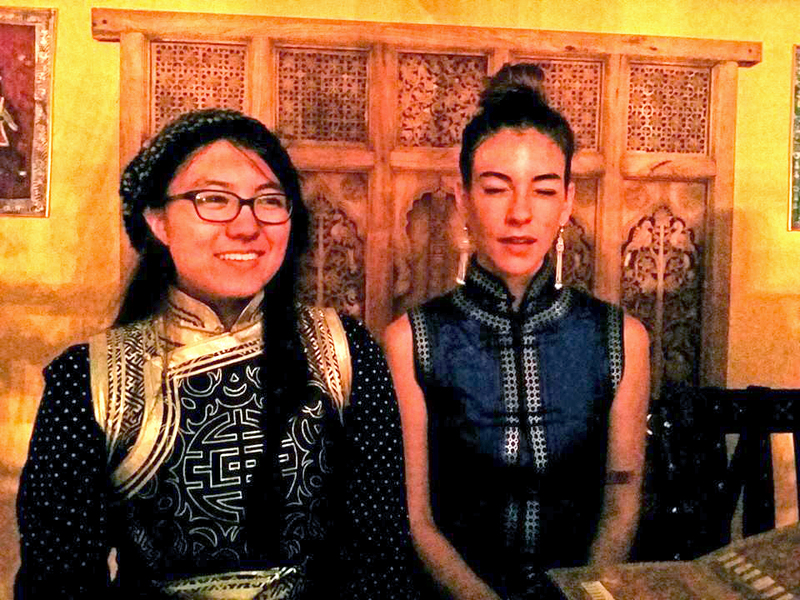 UNT students Meghan Kajihara and Jamie Jones at their birthday dinner in Ulanbaatar, Mongolia wearing garments gifted to them by their host families. Amelia Jaycen: Hi Meghan. So I want to hear more about the “gospel of anthropology” you mentioned. Meghan Kajihara: Well, it’s not about dinosaurs or digging up bones necessarily, even though that’s the basic “gospel of anthropology”. There are a lot of things that you can do with an anthropology degree. Anthropology is the study of man, the study of literature. Anything that you want to look at with an anthropological gaze, you can analyze it from that perspective, and you can find interesting insights. The nature of anthropology is that it is a holistic discipline. At the heart of it is taking perspectives from all these different places and focusing them and seeing what you get. A: How based in examining culture is it? M: That’s one of the four main subfields. There is cultural, archeology, linguistics, and then physical or evolutionary, which is the evolutionary biology of human beings. So cultural is one facet of it, but it’s a really huge facet. It’s all-encompassing, anything about humanity can be about anthropology. Most of my studies have been sociocultural training in anthropology. A: Why were you interested in anthropology in the beginning? Meghan traveling with a friend in Dallas, Texas. M: I knew I wanted to do something with a lot of reading and writing, a lot of historical context and focused more on how people were similar rather than how they were different. I wanted something that would bring unity to all these different threads of my life. There was a soul searching aspect of wanting to find a centered place in the universe and resolve the cognitive dissonance that I see everywhere, and it worked out really well because in anthropology there is the main idea that people are more similar than they are different, and it’s true biologically and culturally. There are huge differences between cultures, but there are a lot of things that are pretty common from place to place, things that look really different on the surface, but they serve similar social functions. So we’re not that different when you get down to it. Someone may live their life differently from you or have a different understanding of what one thing or another means, and that’s ok.
A: So now four years later, what do you think of the decision you made to go into anthropology? M: I’m so happy I made that decision. My first semester I absolutely knew that I was in the right place, and every anthropology experience since then has just reaffirmed that, which is absolutely fantastic. I really feel like I found a grounding in anthropology that I never expected to find there. A: That’s a great feeling! So then you heard about xREZ and joined the lab? Tell me how that happened. M: I was looking for a job to help grow my skills in anthropology, and one of our main methods of research is ethnographic research. It involves observing people, recording those observations and qualitatively analyzing what you find. I wanted more experience with that to give me an advantage if I ever wanted to do field work. And there was this miraculous job posting on the Eagle Network for an undergraduate research assistant that wanted to build their skills in ethnographic research and data gathering, so I applied for the job. At first I was helping a graduate student in the lab gather data about apps and religious education. We combed through app stores to gather information on apps such as who developed them, file sizes, screenshot of the app, things like that. We were recording information on samples of 200 apps at a time in a spreadsheet. A: That sounds tedious but really interesting. M: It was. We based searches around certain keywords that had to do with the nature of religious education that you’re getting from these apps. There were a lot of smart phone Torah or Koran apps, and there were actually some compass apps that will point you toward mecca. So for example, if you’re Islamic, one app has passages from the Koran and a compass to help you orient yourself the right way to pray, which was really interesting. It is just amazing the sort of things people come up with to meet those needs using technology. 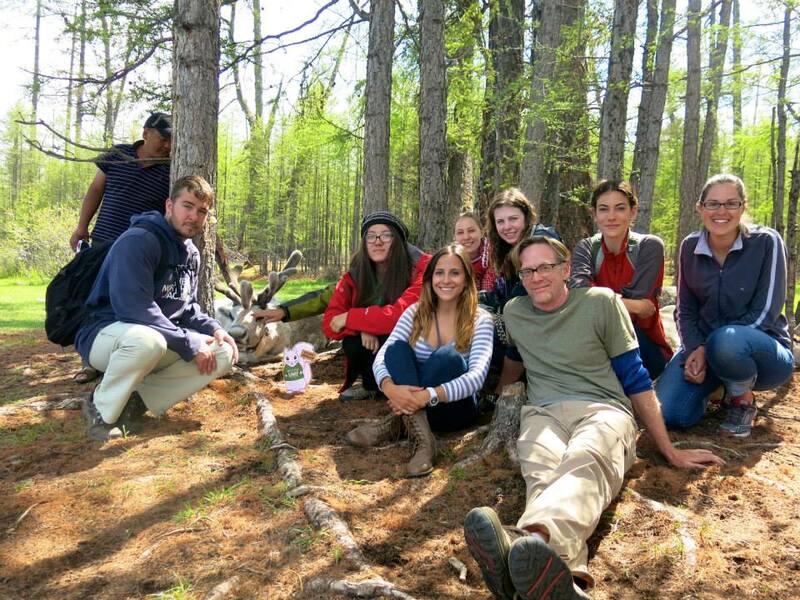 Meghan (center, red jacket) with UNT students in the 2014 study abroad trip near Lake Khövsgöl in Mongolia. A: What was next for you at xREZ? M: After that Professor West said I could work on Seg3D, and I said yes, and the rest is history. I’ve been on Seg3D ever since. A: And Seg3D is a project based around human-computer interaction, is that right? M: It has evolved a little bit. There is still that really heavy computer-human interaction element in it, but I think it’s more about the human, and I think the computer in this case is a more of passive than an active actor. So we are focusing in on the human. We are looking at expert mental models. How does a segmentation expert think about the process? How do they think about their workflow? How do they mentally organize it? The end goal is for us to understand how they take the 2D stimulus from their computer screen and turn it into a 3D output. The process of segmenting data is actually really slow and cumbersome. There is a big bottleneck in the workflow. The goal is to develop better tools, because some of the tools are actually inadequate for what they need to do. It all depends on the size of the data you have to work with, the resolution of the data that you get from whatever imaging modality you used to acquire that data. It’s 3D volumetric data, so it’s the sort of stuff that you see in MRI and CT scans. It’s data that is captured using 3D pixels that show the density of the gray scale to represent the density of the slice of tissue that you’re looking at. A: When you say they’re looking at 2D, you mean computer screens, and you’re studying how they translate that to 3D in their head? M: Yeah, so for example if you tear your meniscus you can go and have an MRI. To help with surgery, they’ll make a model of your meniscus using segmentation. That model will help them figure out the best way to go about repairing the damage. Good models help them perform better, more accurate surgery. Segmentation is used a lot of ways, but that’s just one example of its utility and its benefit. The problem is that segmentation is really, really slow, and segmentation itself is not always really accurate, because it’s incredibly tedious and the tools available aren’t great. So sometimes the tools themselves can be a hindrance to making an actual segmentation. Visual and cognitive fatigue and the amount of time it takes both create a big problem for accurate segmentations, which play an important role in something like surgery. A: Is it only a specialist that would do segmentation? M: It really depends on the field you’re in. In some settings it requires a certain kind of expertise, and in other settings non-experts can do segmentation well. It depends on the end goal. For example, in a research setting often there are teams of people who do segmentation all day long in an effort to map out a certain structure, to identify the volume that these cell structures occupy within a cell, see how cell structures interact with each other or they want to create simulations showing what happens inside the cell. A: Has it been exciting to you to learn how to do this kind of scientific research? M: It has been a really good experience for someone like me who had mostly worked in humanities to see how messy science really is. It has given me a deeper appreciation for science, and research, and for researchers and the work that they do. I have to give “props” to anybody who’s got the dedication to focus their life around a big question that just sort of bothers them, this insatiable itch that they have to scratch and they choose to scratch it through research. But when you find something like that, it’s huge. It feels really good knowing that you contributed to the sum of human knowledge and stuff that nobody’s figured out before. That’s a great feeling. 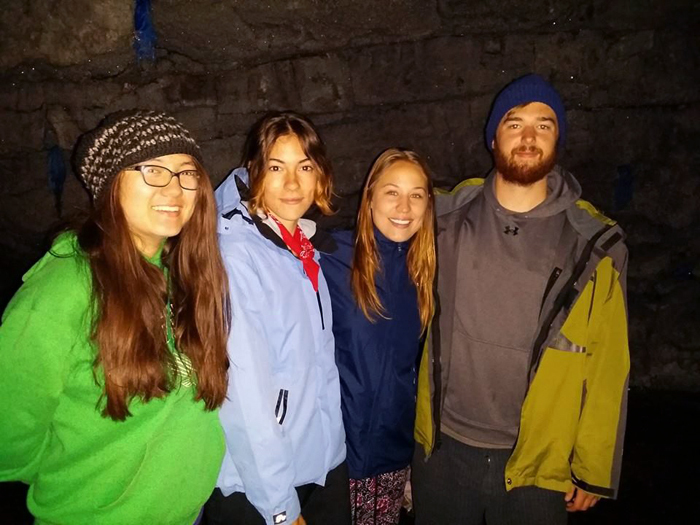 Meghan Kajihara (left) exploring an ice cave in eastern Mongolia with UNT’s summer 2014 study abroad students. A: So, now that you’ve had this experience of being on a long-term project that’s so hairy with science, if another one came up tomorrow would you sign on? Or are you itching to do something different? M: I’ve been looking at things to do after graduation, and I’ve definitely considered research. A: Let’s talk about human-computer interaction more broadly. You’ve talked a little before about technology and what its meaning is for culture and humans in the near future. It’s going to be more and more of an important subject. Do you have any thoughts as an anthropologist on the way our relationship with machines is going to change? M: It’s not an area of expertise of mine, but I think artificial intelligence and machine learning are things that we’re seeing more and more in machines or in objects that we interact with every day and changing the intelligence of the landscape and its ability to respond back to us as we interact with it. Virtual reality is an example of this. And augmented reality is a branch off of that, with our environment responding back to us in ways that it hasn’t before. It used to be you walk down the street, and it’s just sort of a passive experience. You walk around the environment, your feet are on the sidewalk and that’s the feedback that you get from it, and the sidewalk is just flat underneath you. But now when you walk down the sidewalk you get a ping on your Fitbit telling you how many steps you’re taking. Or you can have Google Glass giving you information about the environment. Or smartphone games like Ingress that use google maps directions and GPS coordinates to direct you to certain points. So, even if artificially, our environment is able to respond to us in ways that it really couldn’t before, and I think that that’s going to change the way that we move through the world or the way we exist in spaces since the environment, through technology, isn’t passive anymore. A: Often we feel like we’re in the future where all of this stuff is already happening, but in many ways we’re at the beginning. We’re going to see so much more. M: That’s true. Every day I get on Reddit or Facebook I see some meme about how the future is now, and it’s so true! I remember hearing about Amazon Echo and being really excited and then also vaguely weirded out at the idea of having to call out “Alexa” into my house to ask her to do something. M: It’s a Bluetooth speaker with a responsive vocal interface similar to Siri on the iPhone. So you address it by calling out Alexa and can ask it to play a book from your audible library for example. The idea of calling out “Alexa!” into my house weirds me out a little, but that’s me being a Luddite that likes handwriting everything and is super analog. When I started at xREZ I was way behind on the technology curve, and since I’ve been there, I’ve become one of those people tries to solve all of their problems with technology. I have apps for everything. A: Do you have any reflection on how that may have changed your personality or your approach to the rest of your life? M: I’m still super analog. Now I’m just clunky with my technology rather than other things. I still use pen and paper all the time. It’s hard to look at yourself in the context of how you’ve changed versus how your environment has changed. It reminds me of the physics concept related to the movement of the earth and the people on it. We’re not moving relative to the earth, but the earth is moving relative to everything else in the universe, so we are also moving relative to everything else in the universe because we are moving with the earth. That’s somewhat how it feels, like these things are tides that have swept in simultaneously that I’ve just been pushed along with, things that are just flying by, but because I’m caught up in them like everyone else, it’s hard to see the bigger picture. A: I think that’s probably normal when you’re in the middle of it. M: One thing I have learned technology-wise though is that if you want to make a technology work it’s like anything else you just have to commit to using it, and then it becomes useful and indispensable because you’ve forced yourself to use it. But on the other hand it doesn’t seem like that’s how technology should be. Technology should be smarter than that, it should be adaptive, it should know how we want to use it and be able to accommodate that. A: Tell me about the paper you wrote on gender and Star Trek? M: It was for my honors thesis, and it was looking at the representation of non-binary characters in Star Trek. Non-binary gendered characters, for the use of my paper, are characters who don’t explicitly identify as male or female. I’m looking at two different types of non-binary gender. There are non-binary gender characters in Star Trek who have a characteristic that is very obviously genderable or an identifiable gender role. For instance, they might not self-identify as male or female, yet the main characters of the show ascribe male or female qualities to them. The other group is characters who are neither male nor female in any way that the characters understand, who don’t have those identifiably gendered things about them. I found that characters who are identifiably gendered and binary characters who have something distinctly male or female about them or ascribed to them were generally portrayed more positively or less threatening than characters who did not have anything genderable about them. A: So having something genderable about them was a physical appearance trait? M: Either found in a physical appearance or in the use of pronouns. So, even if a character was very androgynous in appearance, other characters might refer to this character as he or she rather than using a neutral they or non-binary pronoun. There is not much discussion of pronouns in Star Trek with regard to the cultures they encounter. For instance if the cultures they encounter use different pronouns than they do, that’s not really something that they touch on, because a lot of the strange new worlds in Star Trek have a lot of elements that are really familiar including gender and sexual expectations. 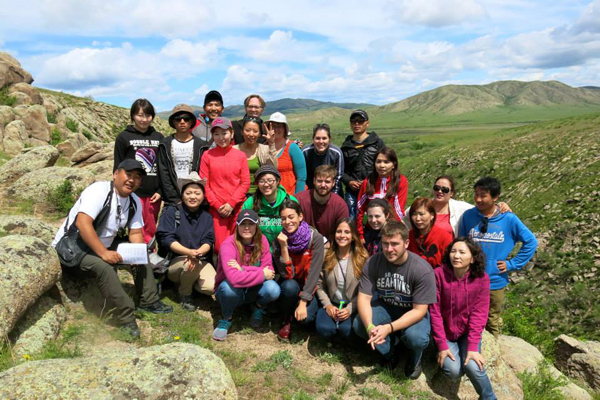 Meghan Kajihara (center, green sweatshirt) with UNT study abroad students in Mongolia summer 2014. A: Fascinating! So tell me about your experience in Mongolia. M: I spent some time in Mongolia for a study abroad anthropology course a couple summers ago, and I’d like to go back there and do research about gender, because there are some interesting things going on, especially in government and administrative education. There are some really cool things going on. M: Yeah, especially with younger people. The Mongolian government started this campaign to try to get more women into managerial or upper-level management positions. They’ve actually had some interesting successes. I had the opportunity to meet really strong women while I was there that were involved in this sort of gender activism. They were doing some awesome really interesting work, so it would be cool to get to go back there and look at how gender roles are shifting. A: Were you already interested in Mongolia? M: I didn’t know much about Mongolia at the time except that it is a place portrayed as super exotic, backward and isolated. But I didn’t meet anybody that didn’t have a cellphone or smartphone like I had. It is very different from here. Ulaanbaatar, which is the capital of Mongolia, is extremely cosmopolitan. It’s a global city, it’s connected to all the major hubs in Asia through trade relationships and cultural exchange. Cultural exchange is a huge thing with Japan and South Korea. Even though people live in really isolated areas around Mongolia, they are still plugged in to that global flow of cultural material and information. Everyone has their apartment in the city where they have their day job, and then they have their yurt which is their weekend house where they go during vacations, where they keep all of their animals, because everybody has livestock. It is a supplemental income. The idea is that you retire from your day job and then work full time in the country. Some people live 50 miles away from the nearest city, really isolated, but they are still connected to that global flow of information and culture. All of the people that we talked to have a smartphone or a satellite dish that they put on top of their house out in the countryside. We met one man who was an artist and out in the countryside, spending his time washing his animals, creating wood carvings and every evening he and his wife sit down and they watch the news, whip out their smartphones. Nobody is isolated, even if you’re 50 miles from the nearest city. Mongolia is super interesting. 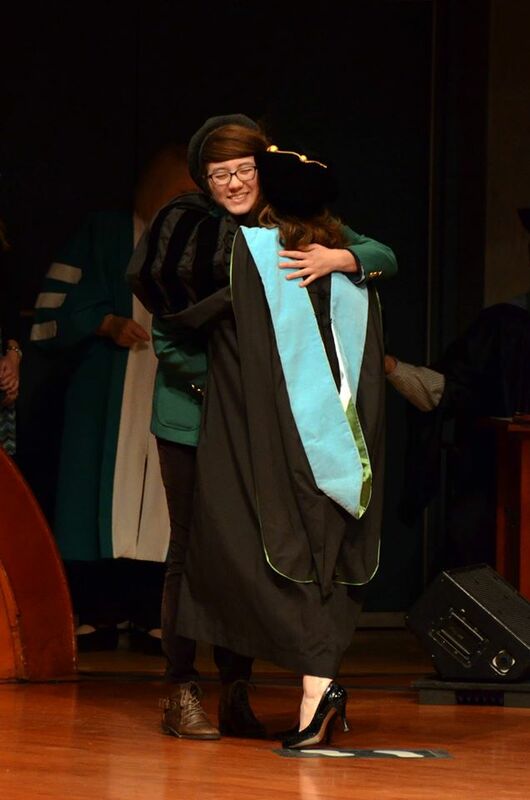 Meghan Kajihara with Vice President of Student Affairs, Dr. Elizabeth With at UNT Honors Day 2014. A: So, what are your plans after May? Are you going to go to grad school, looking for jobs, taking a big break? A: It sounds like you’re casting a wide net, if any one of those works out, it would be awesome. So, Meghan, is there any advice you would give a new person coming into xREZ? Anything you would tell them about your experience? M: If you haven’t worked in a lab setting before, science is hard, and it’s really gross, and it’s going to hurt to come to that realization. But you’ll come to that realization and accept it eventually. Second, take care of each other. The things you accomplish, you don’t accomplish them alone, you always accomplish it as a team. Regardless of whose mouth it came out of first, you all got each other there, and you couldn’t have accomplished it without the people on your team. They’re always super important, so take care of each other. Fun Fact: Meghan was on the short list of students selected to interview for Yale’s Human Relations Area Files research internship.